My love of roasted veggies has come out full force recently. Often times I will just randomly get a craving for bowls upon bowls of them, and that is exactly what happened to me yesterday. 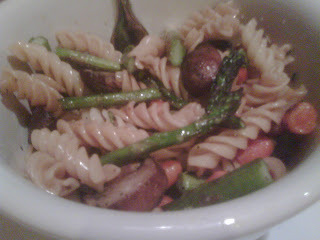 I went out and bought some asparagus and baby bella mushrooms to add to my baby carrots at home. This recipe is easy and can even help you get rid of some leftover veggies you may have in your fridge. Preheat your oven to 420 degrees. Cut vegetables and toss with 1 tbsp olive oil. Place on baking sheet and sprinkle with kosher salt, pepper and Italian seasoning. Toss again and spread out evenly on the pan.Bake for 25 minutes, turning half way through. While the vegetables are in the oven, boil water and cook pasta until tender. Drain and add the remaining olive oil, red pepper flakes and soy sauce. Mix to combine. Add vegetables and mix together.